Why does a shark’s skin feel like sandpaper? Do these animals have scales like a fish, or is there something else on the outside of their body? As we move into the fall season here at the Aquarium, things in the main building start to get a little quieter. The summer crowds have moved on, and there are now even more opportunities to get up close with some of our amazing exhibits. Savvy Aquarium patrons know that The Trust Family Foundation Shark and Ray Touch Tank is one of the best places to visit as we move into the the colder months. Smaller crowds mean that some of our shyest touch tank residents, the sharks, can begin to venture out toward the side of the exhibit. An epaulette shark peers out from the roots of a mangrove tree. If you’re lucky enough to touch one of the five shark species that reside in our touch tank, you’ll notice that their skin has an interesting texture. When stroked from head to tail these animals generally feel smooth. However, gently touch the sharks in the opposite direction, and you’ll find that their skin has the quality of sandpaper. So, what is going on on the outside of these intriguing fish? Look closely at this shark...can you spot anything peculiar about its skin? Instead of having scales like most fish, sharks possess tiny tooth-shaped plaques along the length of their bodies called dermal denticles. 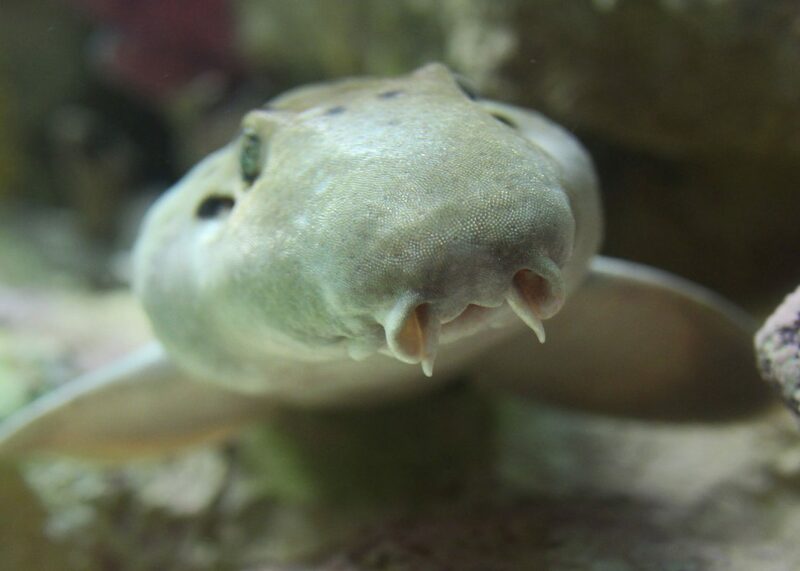 These “skin teeth” make sharks hydrodynamic, meaning that they move through the water very efficiently. In fact, these animals are such capable swimmers that some swimsuit companies have designed racing suits that mimic dermal denticles. These specialty suits have helped Olympic swimmers achieve even faster times in the pool. The underside of an epaulette shark. 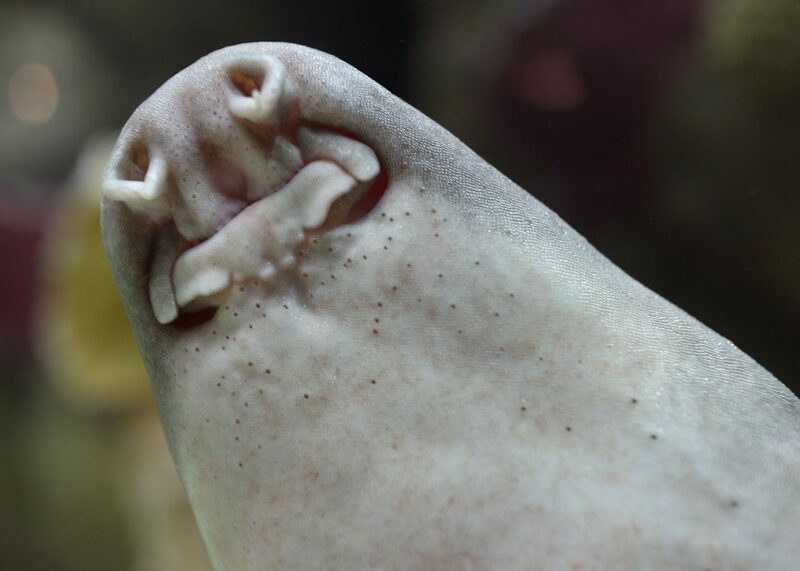 So, now that you have a feel for a shark’s dermal denticles, head downstairs to our Science of Sharks exhibit and check out other amazing adaptations that give sharks an edge in the water. You’ll find out how their body shape also influences their speed and agility. 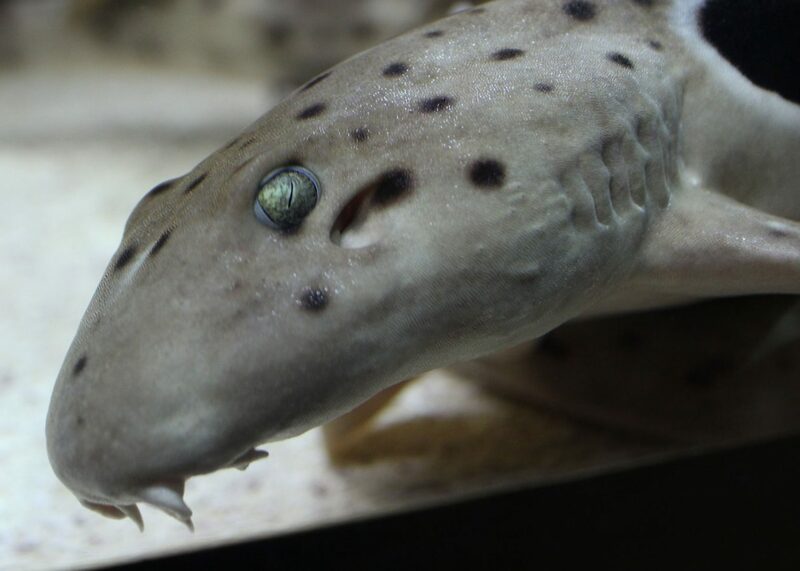 You’ll see what those pores on the underside of that epaulette shark are for. You’ll discover what scientists are doing to understand where sharks are traveling in their ecosystems. And you’ll see all sorts of sharks at different stages of development—eggs, pups, and adults! Fall at the Aquarium is an exciting time, especially because of the exhibit viewing opportunities that are afforded with fewer visitors in the building. Come by and check out our shark and ray touch tank and Science of Sharks exhibits, and maybe you’ll get a chance to experience the marvelous quality of shark skin firsthand!